navratan pulao recipe | navaratna pulav recipe | navratan pulav with detailed photo and video recipe. a popular one-pot meal recipe made with basmati rice with spices and dry fruits. it is a perfect lunch box or tiffin box recipe as it does provide all the required supplements without any extra side dish. 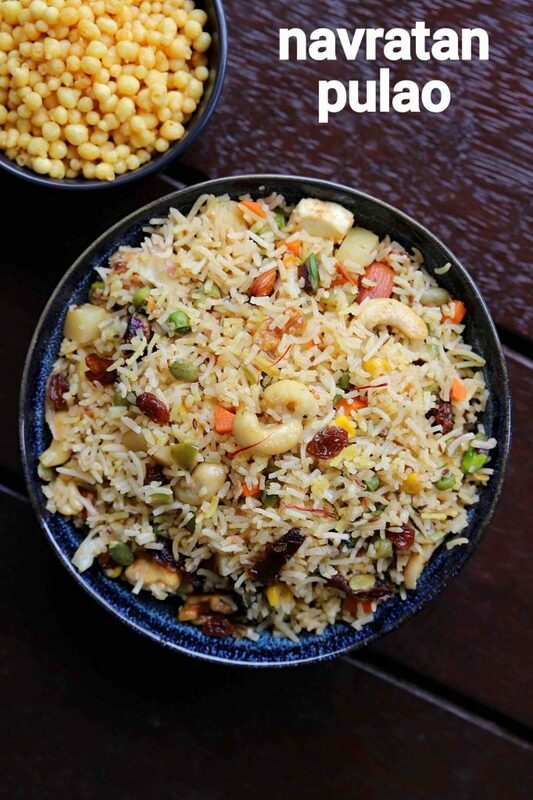 there are myriad variations to this pulao recipe and is typically made with different variations of nuts and dry fruits. 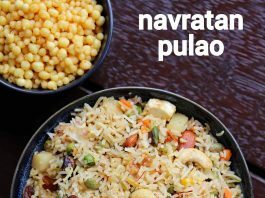 navratan pulao recipe | navaratna pulav recipe | navratan pulav with step by step photo and video recipe. pulao recipes are very common across india and are made with different ingredients and flavours. they are generally made for occasions or as a lunch box recipes as they generally one pot meal. one such type of flavoured rice recipe is navratan pulao recipe known for the generous use of vegetables, dry fruits and nuts. 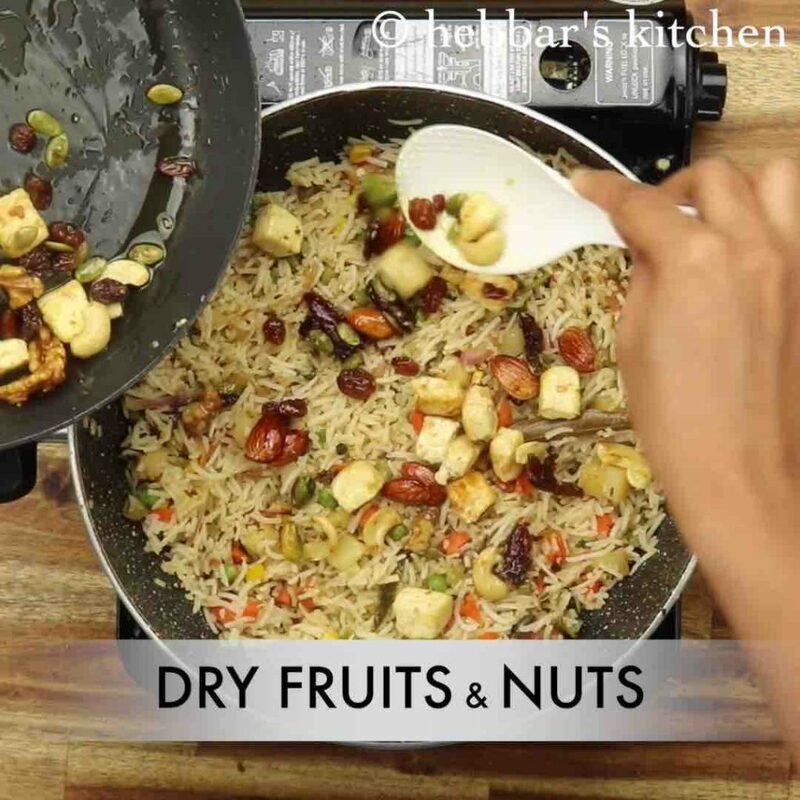 well, to be honest, i am not a huge fan of dry fruits or nuts in my rice-based recipe. be it a biriyani recipe or any other flavoured recipe, i try to avoid it in my recipe. having said that, navaratna pulav recipe is something special and is incomplete without adding nuts to it. moreover, i have tried to make it more on a savoury and mild spicy side instead of sweetened pulao. i assume the same taste even my readers look forward in any rice based recipe, except zarda or kesari bath recipe. in addition, even though it is a one-pot meal, but i personally like it to be served with choice of dal recipe. my personal favourite is moong dal tadka, but it should taste great with any choice of dal or boondi raita. 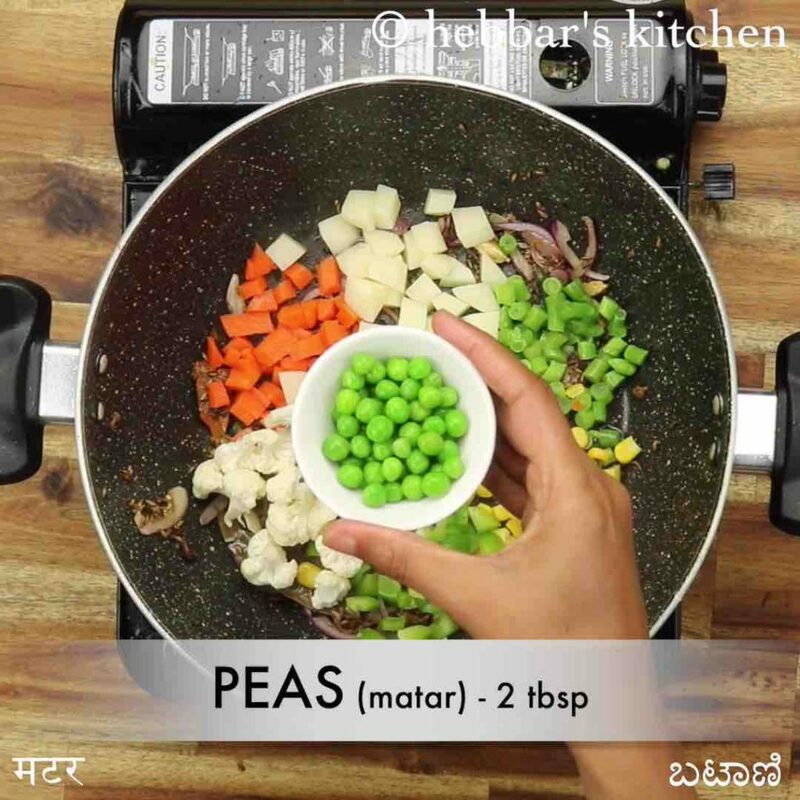 furthermore, some tips, suggestions, variations and considerations while preparing navaratna pulav recipe. firstly, the recipe name is mainly derived from the 9 different dry fruits and vegetables added to the flavoured rice. while adding these many dry fruits makes it special, but it is not mandatory. you can add the nuts whatever available to you locally. secondly, adding basmati cooked rice makes the pulao visibly appetite and flavourful. having said that it is not mandatory and you can add your choice of cooking rice. perhaps the second best option is sona masuri rice in the absence of basmati. 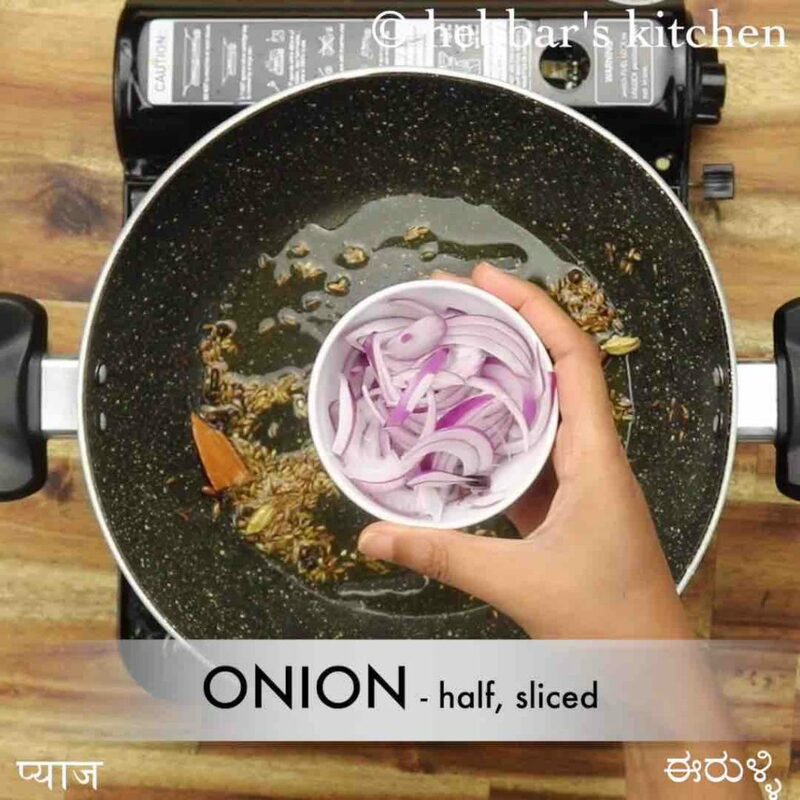 lastly, you can easily extend the recipe by adding any choice of your veggies. but ensure to finely chop them before using it in the pulao so that they cook faster. firstly, in a kadai heat 3 tsp oil and saute spices until it turns aromatic. add ½ onion, 2 chilli and 1 tsp ginger garlic paste. saute well until the onions turn golden brown. further add 9 variety of vegetables. 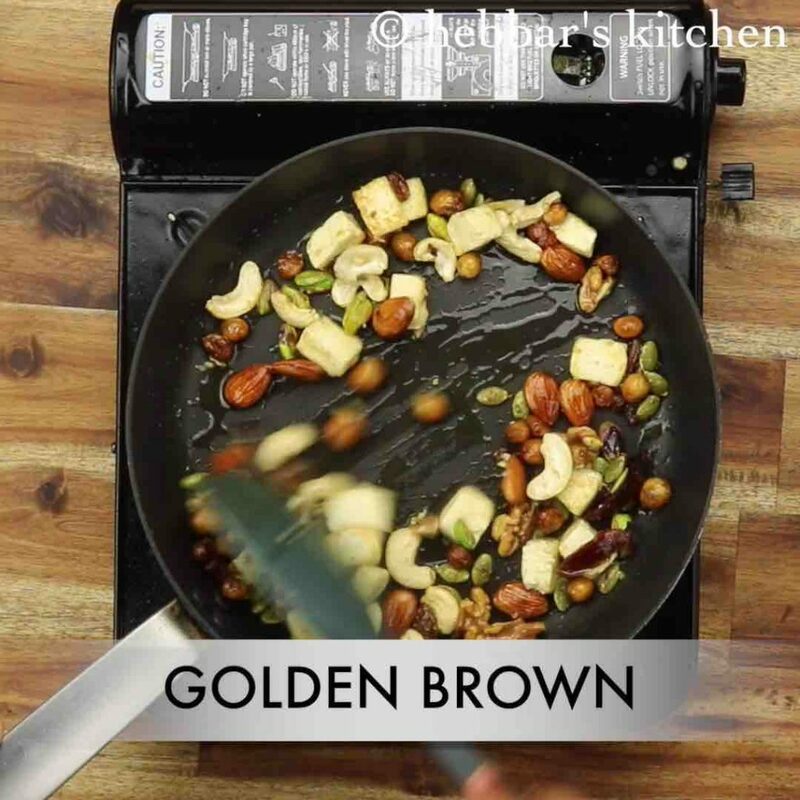 saute for a minutes and add 2 tbsp water, ½ tsp salt and ½ tsp garam masala. mix well. 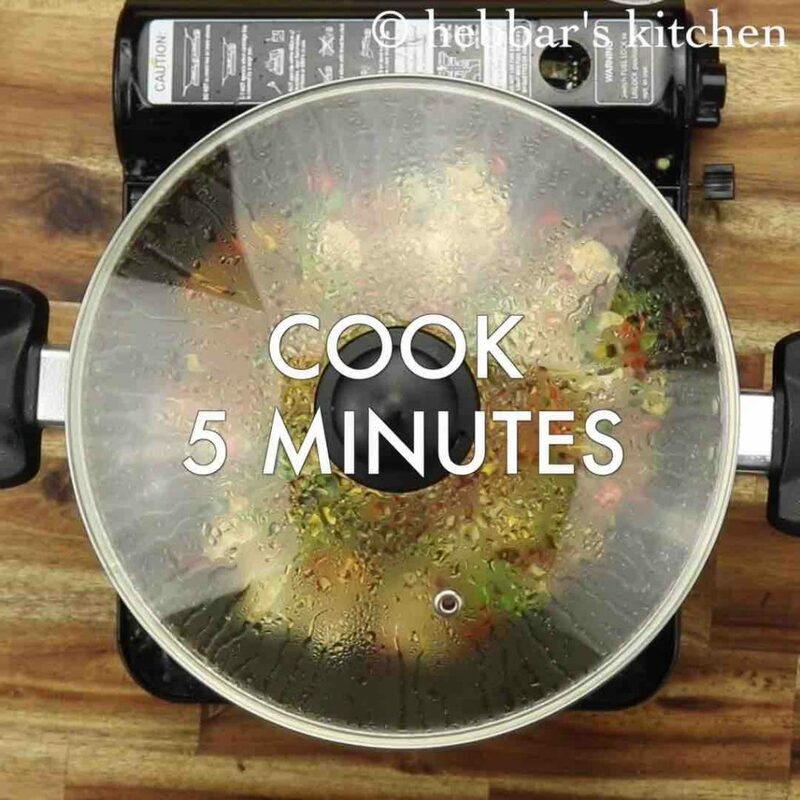 cover and cook for 5 minutes, until vegetables are cooked well. further add 2 cup cooked rice, ½ tsp salt and mix gently. add in roasted nuts over rice. pour 2 tbsp saffron milk spreading uniformly. 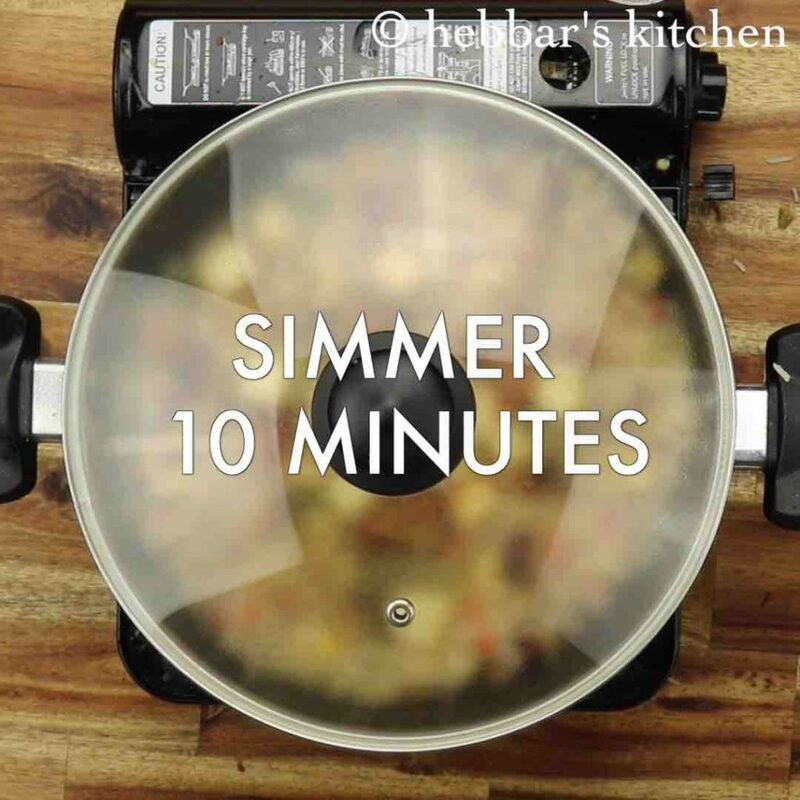 cover and simmer for 10 minutes or until flavours are absorbed well. finally, enjoy navratna pulao recipe with raita. 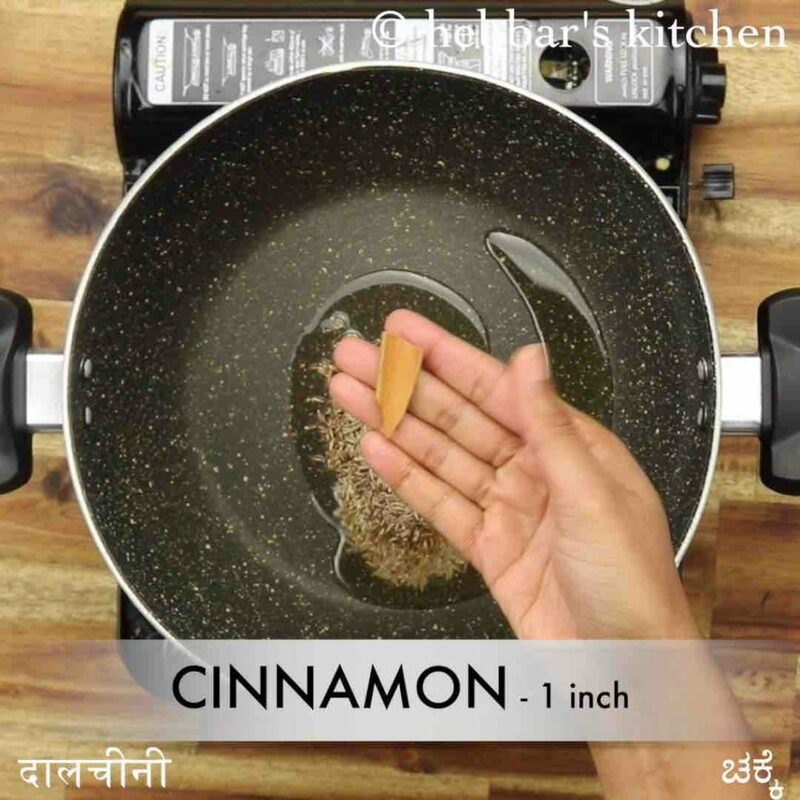 firstly, in a kadai heat 3 tsp oil and saute 1 tsp jeera, 1 inch cinnamon, 1 bay leaf, 3 pods cardamom, 3 cloves and ½ tsp pepper until it turns aromatic. 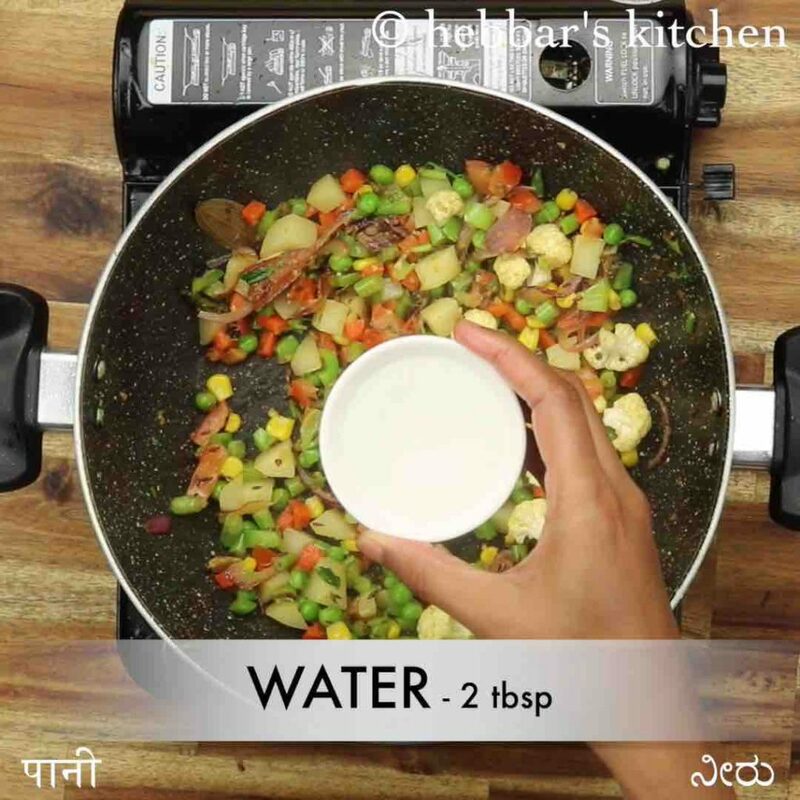 further add 2 tbsp carrot, 2 tbsp potato, 2 tbsp beans, 2 tbsp sweet corn, 2 tbsp capsicum, 7 florets cauliflower, 2 tbsp peas, ½ tomato and 2 tbsp coriander. 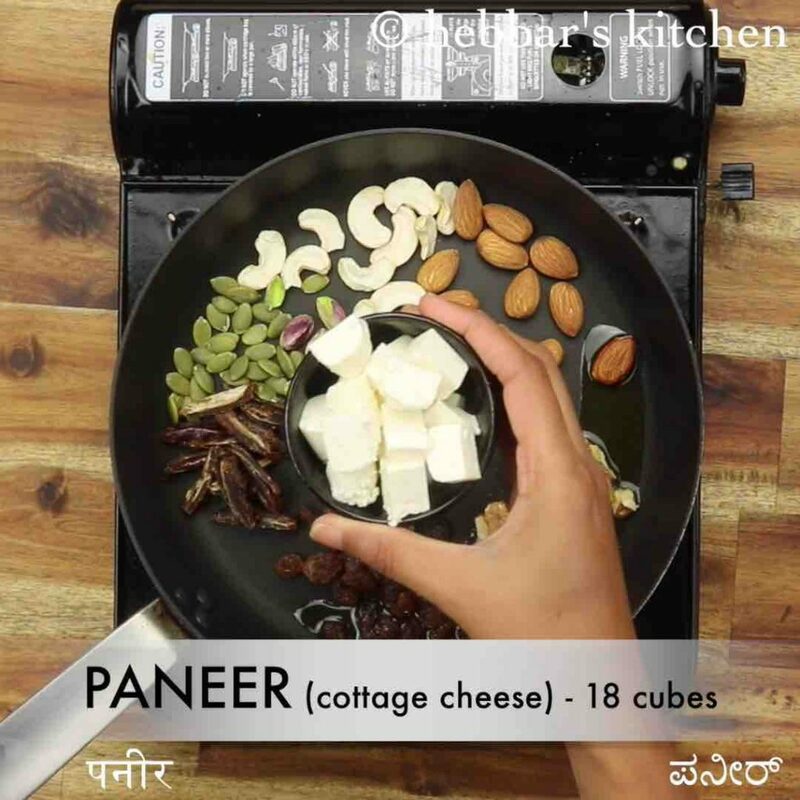 in a tawa heat 2 tbsp ghee and 7 cashew, 10 badam, 3 walnuts, 2 tbsp raisins, 3 dates, 1 tsp pumpkin seeds, 10 pistachios, 18 cubes paneer. 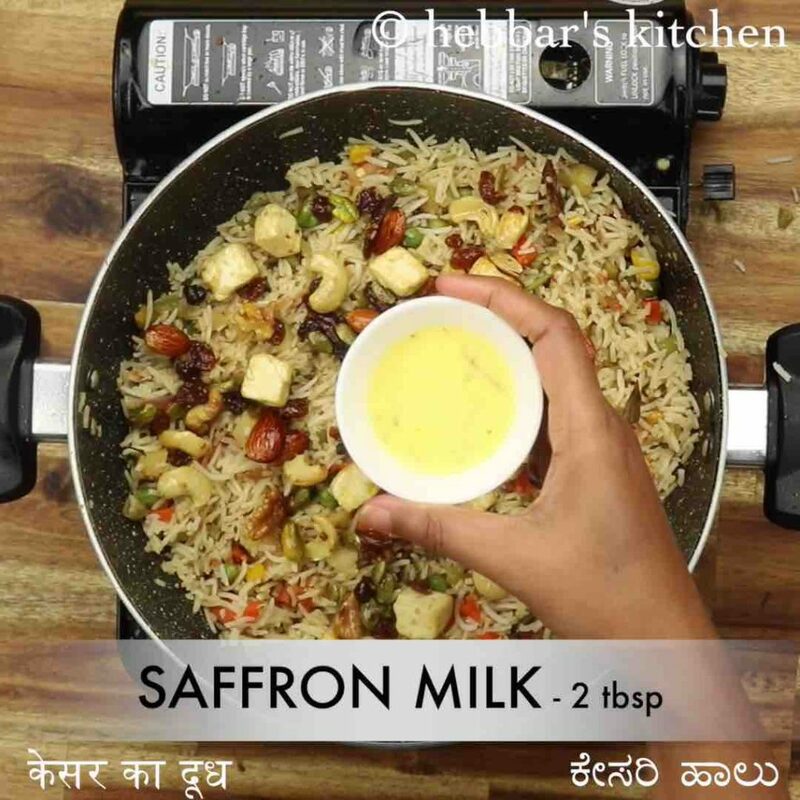 pour 2 tbsp saffron milk spreading uniformly. to prepare saffron milk, soak few thread of saffron in 2 tbsp warm milk. 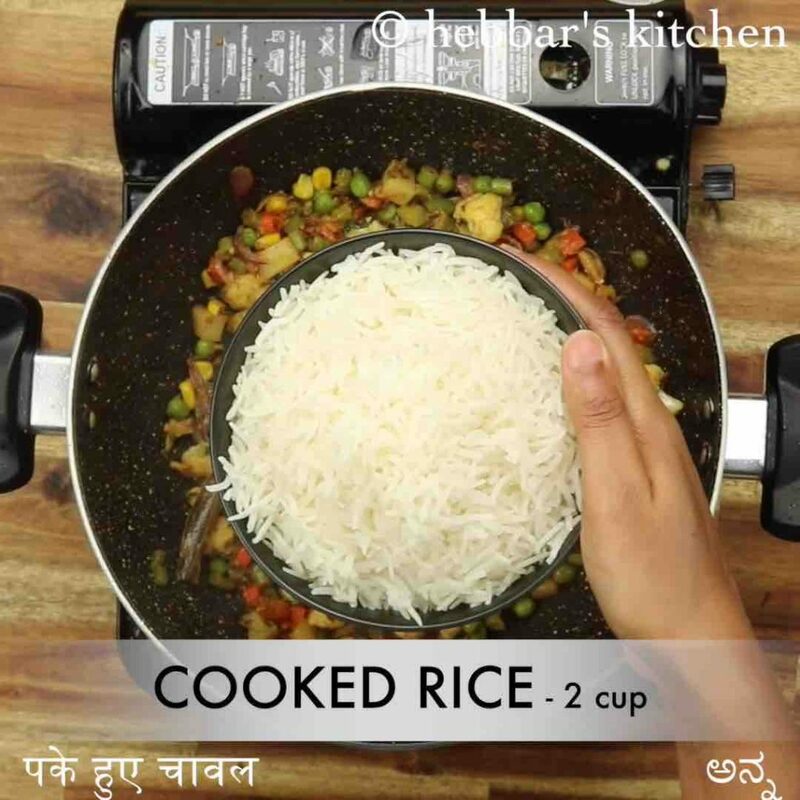 firstly, add any 9 variety of vegetables and dry fruits of your choice to prepare navratna rice. also, adding saffron milk makes pulao recipe flavourful. 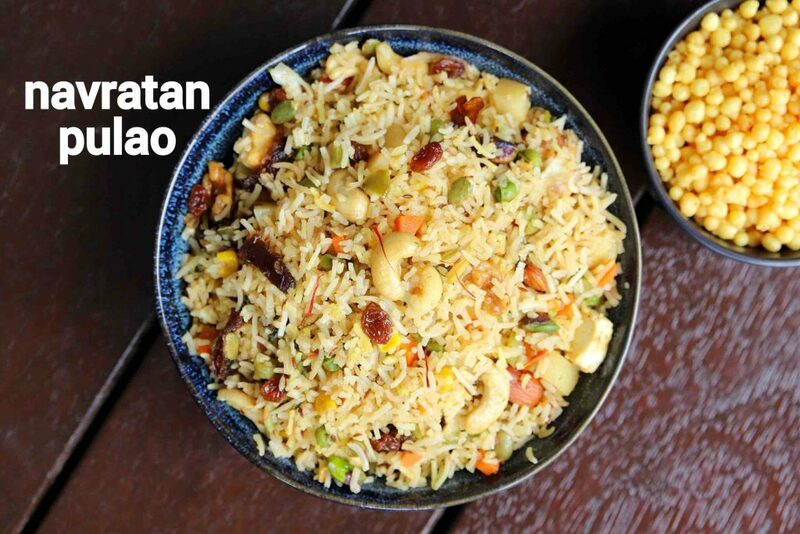 additionally, the crunchy bite of nuts makes pulao unique. finally, navratna pulao recipe tastes great when prepared with leftover rice.